We saw the launch of Yu Yureka Plus in the market and it was the perfect competitor to the Lenovo K3 Note which we have made a comparison of in the earlier posts. 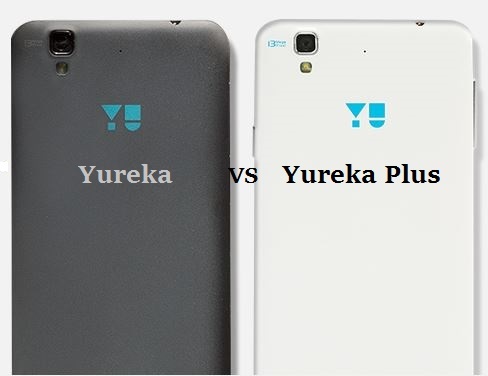 Lenovo Note K3 vs Yu Yureka Plus and here we are going to see the differences between the predecessor of the Yu Yureka Plus the first model launched by Yu the Yu Yureka. There are not much differences between the two except for some factors which we will be showing you in a comparative table form for easy understanding. YU has took up the price a little bit higher too compared to the earlier model and is expecting to capture the 5.5-inch market again after seeing the competition getting higher with many devices being launched in that segment. As we can see that there are not much differences between the two except for three aspects one being the Display which is having the same 5.5 inch size but having 1080p or FullHD resolution compared to the HD or 720p resolution in the Yureka. Another factor is the change in the Camera Sensor which has been upgraded to the Sony IMX 214 in the Yureka Plus compared to the Sony IMX 135 in the Yureka. This will improve the camera performance and the image quality considerably although both have 13MP rear camera. Both the devices are having the same heart with a Snapdragon 615 processor running the devices and the operating system being Cyanogen OS 12 based on Android 5.0 Lollipop. The battery has also been kept the same which I feel should have been improved looking at other devices like the K3 Note having a 3000 mAh battery. The last difference is the price with the YU Yureka Plus being priced Rs. 1000 more than the YU Yureka which is justifiable looking at the slight improvements being made. The Yureka Plus is priced at Rs. 9,999 ($157) and the YU Yureka is priced at Rs. 8,999 ($141).